High Street shops that were prosecuted for selling illegal skin-whitening creams are continuing to do so, the BBC has found. Substances containing hydroquinone and mercury are banned from being sold over-the-counter in the UK as they can cause liver, nerve and foetal damage. Undercover journalists visited 17 shops across London, Leeds, Birmingham and Manchester to see how many illegal products they could purchase. Six of these shops had been previously prosecuted for selling the creams. Of the prosecuted shops, four out of the six resold banned products. The Nigeria-manufactured product – Funbeaut-A – contained 3% hydroquinone, which is more than the strongest medicine containing hydroquinone licensed for prescription by UK doctors. In Manchester, a freedom of information request (FoI) revealed Ms Chucks was the only shop owner to be prosecuted in 2017-18 for selling skin-whiteners, despite BBC researchers finding prohibited substances in other Manchester shops. Ms Chucks refused our request for an interview. Safi George used several illegal High Street bought bleaching cosmetics every day for 10 years. She spent more than £200 a month buying creams. Scared to tell her doctor because of the taboo surrounding these creams, Safi suffered in silence. She was eventually hospitalised for a week for extreme scarring and burning. “I would have lost my life,” she said. Safi was so embarrassed about her use of skin-lightening creams that she began to treat her own scars, and did not seek medical assistance. Her sister Tutu said: “When I saw her she was completely a white woman. The creams have left her with permanent scarring, and she thinks they are too readily available. 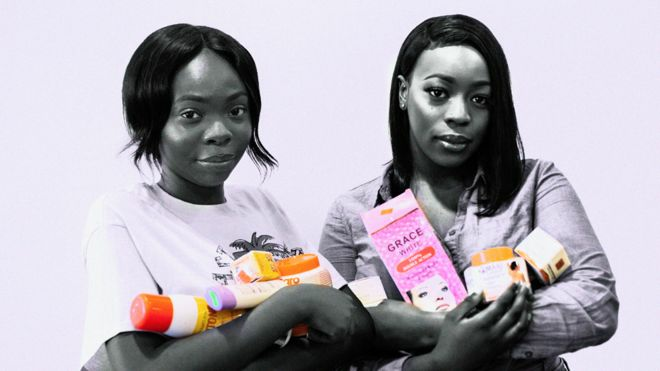 South London YouTubers Arlene Dihoulou and Mariam Omotunde used the skin-whitening creams when they were teenagers. They had no idea the products they were using were illegal. “I just wanted to be desirable”. “We have the sugar tax now, because people see obesity as a big thing. A cause of that is fizzy drinks. So now the prices are higher and the sugar is less. Despite the damaging effects of the treatments, the BBC was told there is “no central collection of data” on the number of prosecutions, seizures or accusations across the country, resulting in a lack of understanding about the scale of the issue. Trading Standards officer Cenred Elworthy said that some traders do stop selling the products after being prosecuted, although the BBC has contrary evidence to this. He said “secondary offenders are often not selling things that are blatantly, obviously full of illegal products”. Elworthy admits “no-one has actually served jail time for selling them” despite being caught still selling the illegal products while serving a suspended sentence. He suggested the industry could be better regulated through “on-the-spot fines” for businesses selling the skin-whitening products, and clearer sentencing guidelines. According to Mr Elworthy, Trading Standards could do more shop visits and seizures, but it struggles to after a 40% cut in resources over the past 10 years. He believes a team of 50 to 60 enforcers would be required in London alone to tackle the issue. Posted by Mr. Bloggy on 08/08/2018 in Alert, BBC News, Dangerous, Fake Goods, Health & Safety, Make-up, News, Precaution, Public Warning, Safety Warning, Skin Whitening Creams, Unsafe Goods, Warning and tagged BBC News, Dangerous, Public Warning, Skin Whitening Cream.